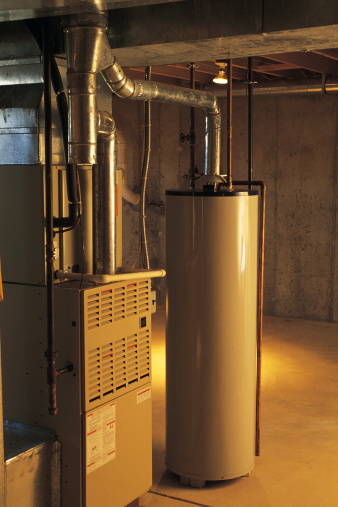 The proper function of a gas furnace, water heater depends on a small control flame called a pilot light. The pilot light burns continuously, fed by a small gas line, and ignites the burner assembly when a thermostatic switch signals that the air or water temperature has fallen below the thermostat's setting. Making certain the pilot light is operating is the first check to be made when the gas furnace or water heater is not providing normal service. Locate the burner chamber door for the furnace or water heater. For both appliances, the burner chamber is located at the bottom of the unit and the access door will be found on the front of side of the housing. Remove or open the chamber door. Inspect the burner chamber and locate the pilot light tube. The pilot gas line is a small metal tube below the burner assembly and distinctive by the slight upturn at the end. It will be apparent, if the pilot is lit, by the small blue flame burning at the end. If you do not see a small blue flame burning, the pilot light is out. Light the pilot light following the instructions printed on the label attached to the outer surface of the appliance. If the pilot operates properly and remains lit, a small gust of air may have been the problem and the system should work properly. If the pilot light will not remain lit when the ignition procedure is followed, you should schedule an inspection and service by a qualified professional.